The Ladies 5’s were glad to be able to get out on the pitch this week, an early frost had cleared and temperature a healthy 2degrees. Lou Davis gave us her usual hokey cokey warm up, left leg in, right leg out and we were fully warmed up. Dragons had first push back, with Fiona Fletcher passing back to a waiting Lynne Price, we soon realised Watton had some strong central players and needed to maintain our passing around them and not get caught up. The 5’s held strong and the battle for play was end to end. We had the strongest defensive line up of Jemima Williams, Amelia Smith and Lou and they were called into action from the start, shielding the D and closing down the opposition. Jemima showed her silky skills at blocking the ball and weaving it past to clear the D. Luckily we had 14 players so plenty of subs for this fast paced game. Laura Hansell got some great runs in up the wing and pinged the ball forward at speed, unfortunately the forwards weren’t quite ready to pick these up and some chances missed early on. Moving around the D Fiona, Catherine Matthews and Lucy Buxton were trying to create chances to slot the ball in, we knew the Watton keeper liked to come forward of the goal and we needed to take chances on the posts. Our keeper for the game was Kat Spiers and although we had said she might not see much action this game, she was surprised and pleased to keep warm by leaping forward and producing solid saves from many directions. At half time the score was 0-0 not for want of trying for a goal by both teams. Pete gave us a half time talk which was needed to clarify our thoughts and focus us for the 2nd half. Following Pete’s advice we headed out, motivated and determined. Good job Vicky Earley is like a machine that never gives up as she hussled the opposition and prevented many balls from reaching our D. Aditi Naik, Mel Widdows and Rachael Matthews applied constant effort on the wings often thankless charging up the pitch and then chasing back down, kept on their toes. In this half there was some lovely passing and calling for the ball in a really tough game. Watton were continuing to threaten our D, and our defence were covering all areas, Lou and Amelia clearing the ball out wide. Unfortunately, Watton nifty top of the diamond worked the ball in and scored from a wide cross across the D. Undeterred the 5’s fought on and with Lou pushing the ball wide up the wing, slotted to Aditi and picked up by Lisa Harwood, slotted through the defender legs to Fiona waiting on the post and into the back of the goal. 1 all, massive cheers by supports and players. The 5’s seemed spurred on by this and on a hit out by the Watton defence a cheeky Lucy nipped in and stole the ball, weaved past the defender and headed to the goal, the keeper was running out and Lucy pushed the ball but keeper went to ground and pushed ball away. Still pushing hard in the opposition D, a big scrabble ensured to get the ball into goal. Lynne grit and determination slotted the ball away, 2-1. The 5’s were in the final throws of the game and we saw another chance on goal by Lucy with another great ball steal. Watton were still pressing hard and gained a short corner, the ball was being pinged around the D, cleared out, back in and they managed to get it into goal. 2-2. Now there was only about 3 mins left, the 5’s pushed on and it was a battle of wills, Watton pulling another short corner, breath held, ball cleared returned and another short awarded with the final whistle. All the Watton players pushed forward and with another scrabble they managed to score. The 5’s did exceedingly well in a very tough game against a strong Watton team, they battled right to the nail. Kat on her debut in goal for us, played extremely well under constant pressure. POM was Jemima Williams. Dragons 7s were pleased that the pitch wasn’t frozen this week as they were keen to get out and play after last week’s postponement. Their opposition was Norwich City 7s and Dragons faced them with determination. City won the toss and chose to take the first push back. Dragons pressed forward from the start, winning the ball and putting City under pressure. New to 7s Kelly Mills got the scoring under way in the first 10 minutes, after a scramble in the D saw the ball roll into goal. Dragons carried on pressing City and Jemima Dorman soon followed Kelly’s lead, scoring goal number 2. Dragons continued with their excellent play, with lots of good passing around, making full use of the pitch. City made some good challenges and did give Dragons defence some work to do, although keeper Alice Smith didn’t have the busiest of games. The defence of Katy Saide, Emma North, Frankie Paul and Hattie Gale pushed forward and aided the midfield in stopping any of City’s attacks and got the ball back up the field, with Stevie Spencer always ready to receive the ball and tackle City. Ruby Rose-Turrell had another great game, usually a defender she was placed at bottom of the diamond and proved very useful getting the ball around. Another defender, Esme McKinnon-Evans also played in a different position, this week she was also in midfield, where she excelled so much that she earned herself the POM. After Kelly scored her second goal (where she flew! ), Esme slotted in her first, bringing the score line to 4:0 to Dragons at half time. Both teams continued the second half with the determination they started with. Dragons continued to push, with the forwards of Kelly, Jemima, Katie Moulson, Claire Stuart and Sophie Thurtell all getting the ball into the D. Dragons persistence kept being paid off, with Kelly scoring 3 more times and Jemima also scoring another 3 goals. Katie got herself in great positions on the post and her positioning was rewarded when she touched the ball and nudged it into the corner of the goal. Dragons were elated with the final score of 11:0! Although the result doesn’t reflect the great effort put in by City, who have improved since the last time the two teams met earlier in the season. Dragons had something of a hockey lesson from Broadland, who did everything expected from a top of the table team. 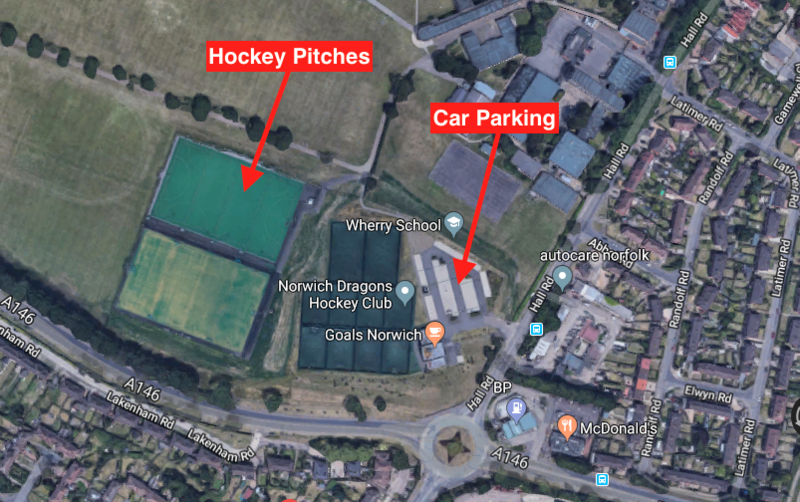 Earlier in the season, Dragons held Broadland to a 4-4 draw, but Broadland have since moved on to be a hard-hitting, tight-marking team and on this occasion their power play was superior to the Dragons’ passing game. However, despite the scoreline, Dragons enjoyed the game and their post-match analysis of how they could do better. They stood up to the onslaught with determination in a way they would not have been able to do earlier in the season. They kept their heads up, kept tackling, and their speed in re-setting improved a lot. Every player gave of her best and there were several nominees for player of the match with Amelia Keitley-Webb just taking it with her ability to beat opponents and her flair all over the pitch. She was pushed close by Kat ‘The Cat’ Spiers who made a string of fine saves and clearances to keep the score respectable. Only the finest placement or the ‘double moves’ across the circle could beat her. Possibly the biggest indicator of the gap between the two teams was that the Dragons failed to get a penalty corner, whereas in recent games they have been creating plenty of chances. This time, Broadland’s tight marking and strong interceptions meant the Dragons’ penetration was not quite good enough. Katy Cole wriggled her way through on a few occasions, and Lois Metcalfe took up some excellent positions on the left – and did a very good job of holding the game up, hoping that someone could re-lead for her. If the 8s can do more practising together as a unit, it will help their team understanding, and their positional play will improve, leading to more opportunities for shots. Jo Baker, Johanne Steward, Ruth Barton and Anna Chapman can all look back at some excellent tackling and determined defending, but every so often one of those raking long passes would find its way through, with the Broadland forwards showing how to nip onto the posts and get a shot away. Jess Lockwood also did very well defending on her return to the squad. Sophie Drew stuck to her marking task and also showed plenty of speed in midfield. And a very special mention to Louise ‘Brooksy’ Brooks and Gemma Ballard, our Get Back Intos, who show improvement in every game in speed, ball control and ability to read the game, and are starting to be very good attacking midfielders. A late call-off meant Dragons went with 13 with tacticians Katy and Jo needing to rework all the subbing plans – not easy when you are trying to give everyone equal pitch time and maintain a balance in the team. Step forward Amy Forse as manager, who did an excellent job of spotting when players just needed a quick breather, and also how to manoeuvre the squad. She moved Bridget Le Good to left back – not a player used to ‘running 1’ at defensive corners – but this was something that mostly worked, and the player’s ability to shift the ball up the pitch helped to relieve the pressure. So the 8s, who love a good battle, can’t wait to get back to training on Wednesday and put their lessons into practice. Next week’s opponents have dropped out of the league, but have asked if we can have a friendly, so look out for emails from Katy. Whenever it happens, bring it on. Following a slightly longer than ideal Xmas break, Norwich Dragons 6s played their first match of the new year against top of the table Bury St Edmunds 6s. Bury had been our first opponents of the 2016/2017 season and we came away with a 2-2 draw, so expectations were high for a good result. There were a number of players back after minor injuries before Xmas and we were joined by Chris Orme a player new to our club having previously played over many years for Beeston Hockey Club based near Nottingham. Welcome Chris! After a bright start by both teams Bury made the breakthrough first, scoring a well worked goal close in on our net. Dragons 6s came straight back and put together some well worked runs into the Bury circle which came very close on a number of occasions to equalling the score. Then, against the run of play, Bury managed to find a hole in a tight Dragons defence and score a second goal. Regular Dragons player Owain Hall had been unable to make the start of the match due to other commitments but arrived 20 minutes into the first half and made an immediate impact. Linking up with Andy Key and Darryl Robinson, Owain passed and then received the ball in the Bury circle, striking home a great goal to bring us up to 2-1 behind. Dragons continued sustained pressure and went into half time with Bury St Edmunds 6s leading Norwich Dragons 6s 2 goals to 1. The second half once again saw Dragons pushing forward with some fast penetrating play, although Bury were still not to be underestimated and made some good counter plays into our circle. Special mention must go to our Goal keeper James King who made a fantastic one on one save against a Bury striker. Great positioning and reactions. During this time James Hansell was noticeable in being solid in defence and also making some good runs up the left wing. The game started to turn around for Dragons when early in the second half when good work by Ray Hansell, Darryl Robinson and Rob Lee put Ed Crosier in a great situation for him to slot in a well taken goal, bringing us level at 2-2. From the restart, Dragons continued to pressurise Bury and this led to once more the front combination of Lee, Key and Crosier setting up Darryl Robinson for a well taken strike and goal. 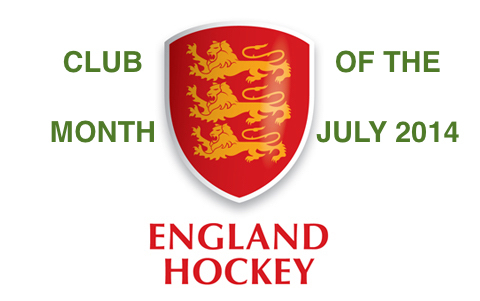 Norwich Dragons 3 Bury St Edmunds 2. Clearly from this position maintaining our lead while keeping the pressure on for a 4th goal resulted in some very near misses for both Dragons and Bury and the game was beginning to climax with some entertaining hockey. Unfortunately the Dragons win was not to be, as with only a few minutes remaining a Bury striker ghosted in to the back post and managed to score pulling the tally up to 3 – 3. The final 10 minutes maintained the pace of the whole game and with a penalty corner awarded to Dragons in the dying minutes there was the hope of a win at the death. Unfortunately Mike Banham’s shot went millimetres wide of the left hand post and shortly after the final whistle was blown. Although we were disappointed with the draw after pulling back to lead the match towards the end, it was a good result against a strong Bury side who had certainly improved since the first match of this season. The way the game was attacked by the Dragons 6 team and the high and constant work rate, along with our new addition to the team, gives us plenty of encouragement to be able to reverse some of the losses in the first half of the season. We hope to continue this theme next week at the UEA against UEA 4s and make some moves towards a late season push up the table. The match started pretty well with several short corners in the first half resulting in a goal from Bobby. This was followed by a goal from Magpies, and then a crucial goal just before half time. In the second half the tide really turned against us and the magpies took control of the game scoring twice. Dragons had a few chances towards the end of the game, but couldn’t quite get the ball in the back of the net. Final score 1 – 4.